Home Portfolio Project: Skyline Landscaping, Inc.
Skyline Ponds, a division of Skyline Landscaping, Inc., has been in business for 30 years and has become the premier waterscape builder in Southern California. 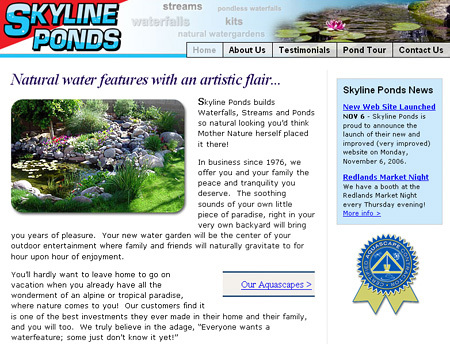 They specialize in creating beautiful and natural looking waterfalls, streams and ponds. Created a completely new design, based on their logo color scheme and showcasing their various water features. Mofified all the navigation, links, and site structure so that it would be much easier to use. This technique both makes the pages load faster (less amount of images to have to download), as well as no 'preloading' necessary because the hover shift is instantanous. You can see this technique in action on their 'About Us' page. We are thrilled with how the web site turned out. Now, if we could just design our backyard stream to look as nice. Hmm, what's their phone number?